Material:Powder-coated steel frame,it is resistant to sweat and moisture, which helps prevent rust. ZENY exercise weight plate rack is built for optimum safety.Whether it's for your home or a professional gym,this ZENY weight rack makes organizing weights a breeze,allowing you to focus on the heavy lifting,free up more space in your gym while you enjoy a comfortable workout! Save Space This rack features durable steel construction and a compact design to easy storage your equipment & centrally located any corner. Heavy-Duty Can accommodate standard 2" plates on each of its eight posts.Max load 400 LBs. High-Quality This organizer with a heavy-duty structure that It is resistant to sweat and moisture, which helps prevent rust buildup over time guaranteeing that the equipment will be reliable and long-lasting. A FRAME DESING: Space saving A frame design provides easy storage. Store your plates in a designated space for easy accessibility while keeping things organized. THIS VERTICAL BUMPER PLATE / OLYMPIC PLATE TREE IS THE ULTIMATE SPACE SAVER. 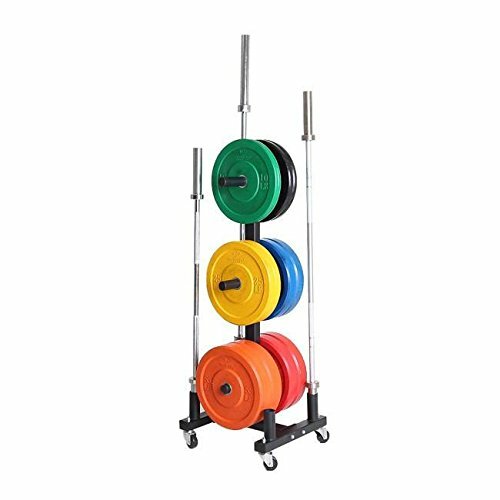 WITH 6 X 8.5 PEGS TO STORE YOUR PLATES AND 4 OLYMPIC BAR HOLDERS THE XM 2 PLATE TREE IS SUITABLE FOR ANY ENVIRONMENT. THE COMMERCIAL WHEELS ALLOW FOR EASY MANEUVERING. WHEELS CAN LOCK INTO PLACE FOR EASIER STORAGE. Commercial wheels allow for easy maneuvering. 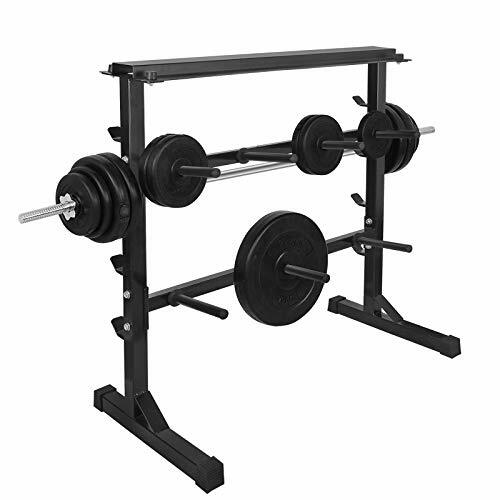 The CAP Barbell Olympic plate and bar rack is built tough for heavy use in the gym or at home. 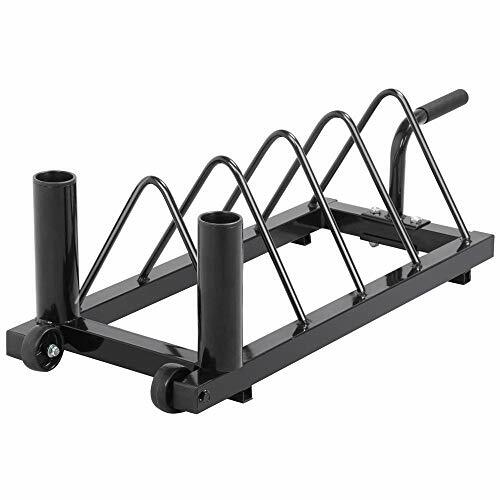 This rack holds up to four Olympic 2-inch bars in a vertical Orientation and has six plate pegs to hold all your plates. Helpful plastic end caps on the plate pegs help with organization, denoting 5, 10, 25, or 45. Brand: CAP Barbell | Manufacturer: Cap Barbell, Inc.
BH-9 Features: Offers six positions to store plate and two places for Olympic bars. Max weight is 1200 lb. (200lbs per peg). 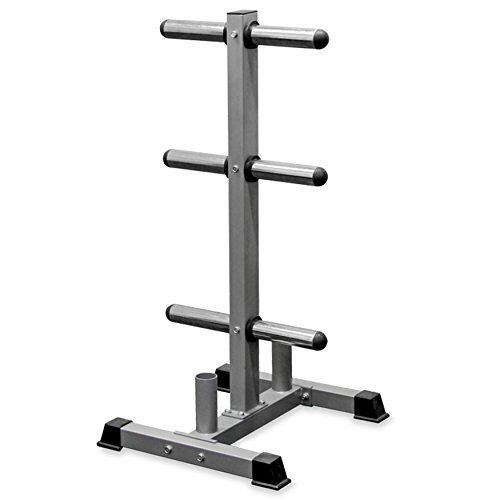 Holds standard weight and barbell sets, rounded pegs for easy loading and unloading, solid steel construction. BH-7 Features: Provides a place to store your plates and bars while not in use. 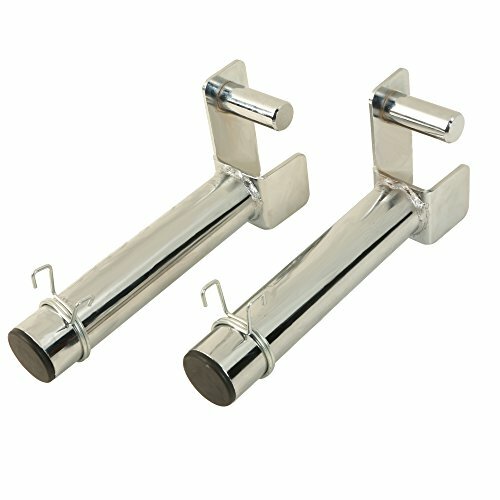 6 steel Olympic chrome posts hold up to 900 lbs. of weight. 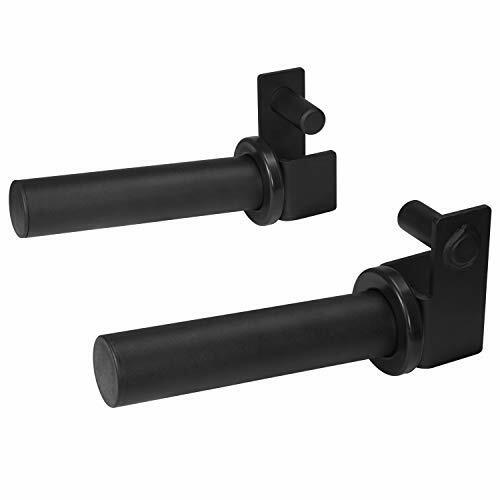 2 bar posts support either your Olympic curl bar or Olympic 7' bar. Wide solid steel foot plates are covered by high density rubber to disburse the load. Achieve a fitter and healthier body right in the comforts of your home with the Combo Weights Storage Rack by Marcy! Save more and make your home your new favorite place to work out with this premium gym organizer that's designed to help you have more efficient bodybuilding sessions by giving you a special storage space for your fitness equipment! Racking your weights is an important part of any workout, so don't skip out even when the cleanup afterward proves to be a challenge! Store everything in a single place with the Marcy Combination Weight Storage Rack. Made from premium steel tubes, this equipment stand exhibits a high-quality structure that combines functionality and practical design, creating a storage rack that can withstand daily, heavy use. This three-layer rack with four easy access storage posts offers a multifunctional storage space for your dumbbell set, Olympic/Standard weight set, medicine balls, kettlebells, and other weightlifting tools. Reinforced with premium coating, this gear's hammered finish protects its overall structure from scratches, ensuring that its function, style, and tone will last for years. 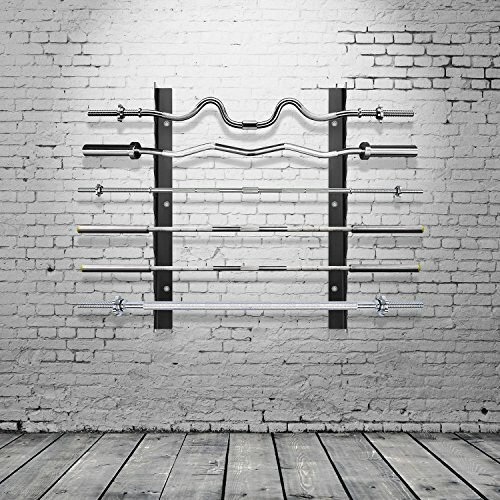 Additionally, this weightlifting accessory storage rack comes with four rubber end caps to protect your floor from any possible damage, scratches, and cuts. You won't have to worry about having chipped or crooked floor surfaces with this storage rack! Invest in reliable weightlifting storage that offers function, style, and convenience, allowing you to harness the benefits of training efficiently in your home gym. You receive all of this and more with the Marcy Combo Weights Storage Rack! HAMMERTONE FINISH - Featuring a sturdy structure that exudes elegance and functionality, this storage rack is hammertone-finished to protect it from unwanted scratches, ensuring a beautiful and reliable storage rack that will last for years. RUBBER BASE CAPS - Having a scratch-free floor is a must in the execution of safe and secure training. 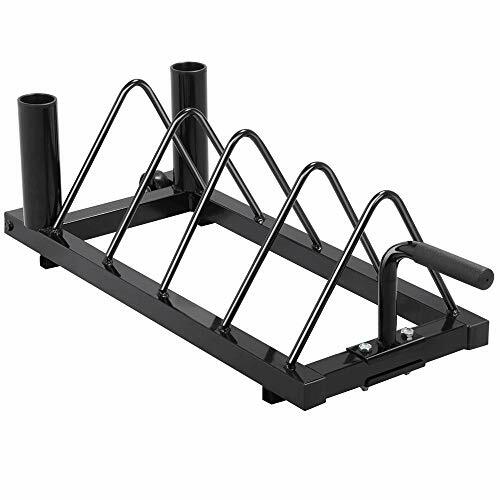 The Combo Weight Rack from Marcy is specially designed with four rubber end caps to protect your floor from any possible damages. SUITABLE FOR HOME USE - Enjoy your everyday exercise regimen with this weights storage rack! You can now perform your training at your preferred time in your home, providing a convenient and cash-saving way of getting a fitter and healthier body! 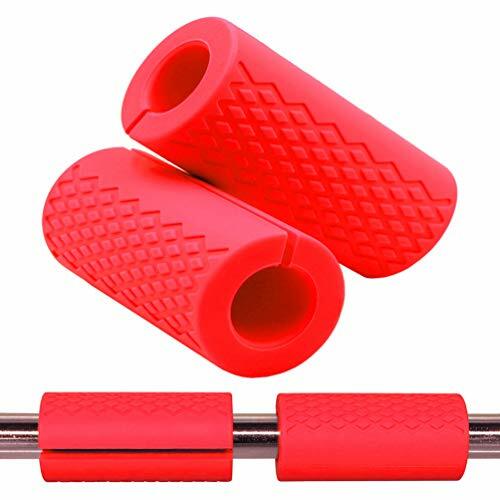 Easy to use, Portable,Package Include: 2 * bar grips. Keep your Bars Organized -- Save more storage space for your fitness equipment with this premium gym organizer which is designed to help you have more efficient bodybuilding sessions. Heavy Duty Construction -- Made of Q235 carbon steel, this gym organizer has a sturdy structure that won't collapse under heavy loads. Gain the benefits of training efficiently in your home gym with function, style, and convenience. Durable Powder Coated Finish -- Reinforced with premium coating, this gear's hammered finish protects its overall structure from scratches, ensuring that its function, style, and tone will last for years. 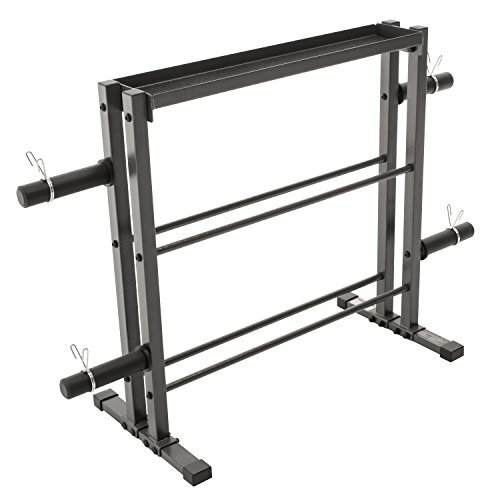 Muitiple Usage -- Hold 6 bars, also offers a multi-functional storage space for your barbell set, Olympic/Standard weight set, and other weightlifting tools, allowing you to store everything all in one place. 100% Satisfaction -- Comes with a 2-year manufacturer's warranty, and 100% Guaranteed Satisfaction and Replacement for Damage. 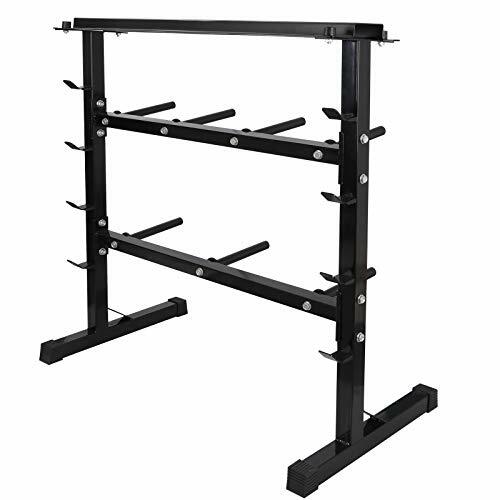 Easy to get money back if you unsatisfied with our Olympic Barbell Rack Bar Storage. Please keep it away with children or elders to avoid accidents. If there is any problem about the All-in-one rack,please contact us,we are willing to help you.  Large Storage The rack is combined with dumbbells, barbells and weight plates storage together.2-tier with 7 Rods for weights storage,and 4-tier barbell racks allows most size exercise equipment well organized.It is perfect for exercising.Fit for personal home or commercial gym use.  Solid Construction The whole body is made of sturdy steel with powder coated.Make welding perform good.Tough and strong,not easy to wear.Practical up-tilt posts will safely hold your plates and no worry about fall off problem.Stabilized in a rectangular frame.Rubber feet design will protect your floor or carpet from scratching,and also provide extra anti-slip effect to make the rack more stable. 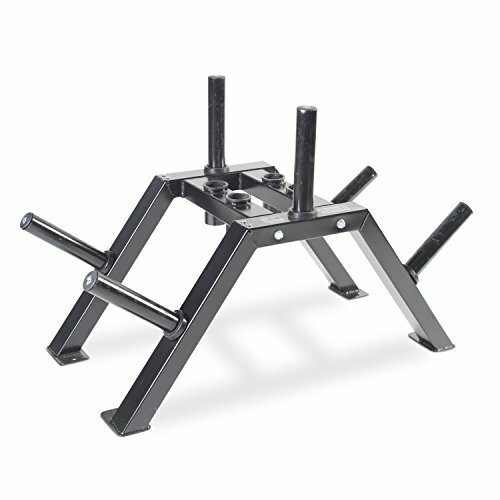  Easy Assemble It only take minutes to set up the stand holder.No additional required.You just need to follow the instruction and install it step by step.The big guy which can hold up to 550lbs will present front of you. 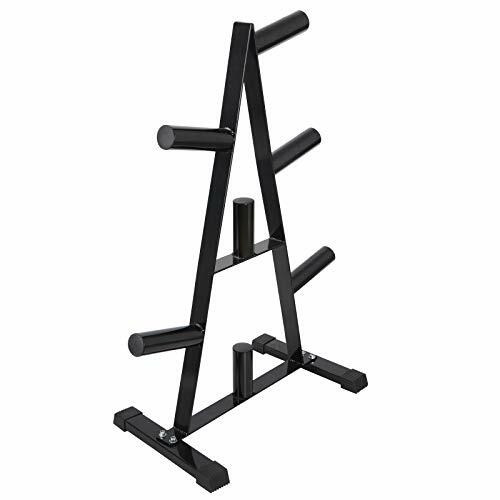  Practical & Good Looking The rack accommodates almost all dumbbell sizes and styles, including neoprene and cast iron.And it will not take up too much space and easy to be placed in any room or place.The furniture-grade look fits nicely into your decor.Thus,it will appear to you as a professional in sports.  Dimension Overall measured:39.4(L) x 20.5(W) x 40.35(L).The weight is about 38lbs.The rectangle tube size is 45 x 45 x 1.5mm.The tubular tube size is 25 x 25 x 1.75mm.The rods to hold weight plates length is 7.9.The space between buckles to hold barbell is 38.6. 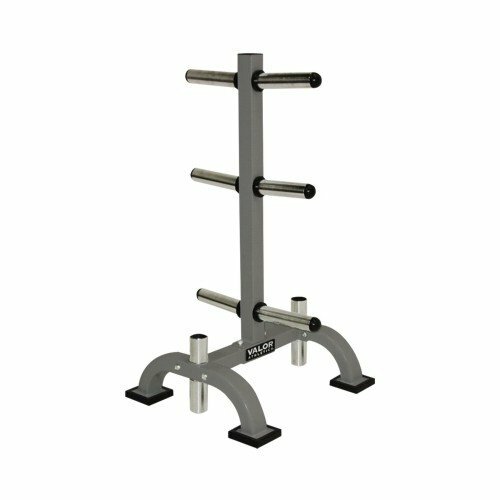 Rectangle tube size: 1.7 x 1.7 x 0.06"
Tubular tube size: 1 x 1 x 0.07"
Distance between buckles to hold barbell: 38.6"
Length of rods to hold weight plates: 7.9"
2.Please consider the weight capacity of the weight storage rack before using. 3.Please keep it away with children or elders to avoid accidents. 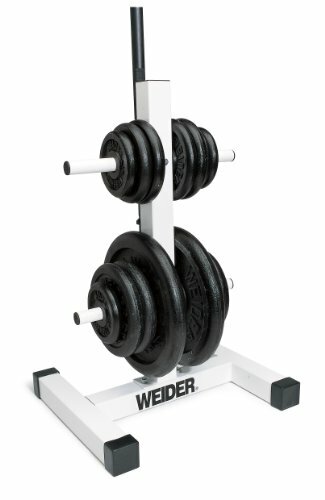 4.Weight plates in the picture are not included in the package. Perfect for storing barbells and weights for exercising at home or gym. Durable - It accommodates most dumbbell sizes and styles for years of use, including neoprene and cast iron.